The Black Hole Universe consortium is an Initial Training Network funded by the European Commission and made up of seven leading astronomy institutions across Europe. 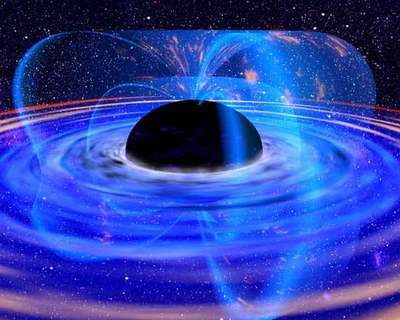 The network aims to reveal many of the hidden aspects of black holes and their impact on the universe. Our main scientific focus is on X-ray binary systems which contain the black hole remnant of a massive star orbiting a normal stellar companion and feeding from it through a process called `accretion'. These systems are laboratories for studying accretion and its effects, including powerful X-ray radiation from the superheated gas falling on to the black hole, rapid variability and emission signatures of strong gravity originating in the extreme conditions close to the black hole, and the production of powerful relativistic jets of plasma which can affect the surrounding environment. The Network will also study related objects, including systems containing neutron stars, which will reveal crucial differences from the black hole systems caused by the presence of a solid surface instead of the mysterious event horizon. On the largest scales, the Network will study the connection with black holes with masses of many million solar masses in the centres of galaxies. These show remarkably similar processes to those seen in X-ray binaries, but on scales so large that black holes can terminate the growth of whole galaxies and therefore play a key role in shaping the universe as we see it today. This research will be performed by 10 PhD students and two young scientists at the postdoctoral level, who will be based at one of the participating institutions but will also spend time with other institutions in the Network, to make full use of the network-wide expertise. Besides making many new discoveries in black hole astrophysics, the other key aim of the Network is to train the next generation of astronomers, astrophysicists, and space scientists to work in an exciting and international environment, primarily through the research projects, but also through training schools in multiwavelength astronomy and black hole astrophysics. The students will also receive industry-led training and career development from our industrial partners, all leading space science companies with expertise in building and supporting satellites and other space missions, as well as building precision scientific instrumentation. The combination of state-of-the-art training in a forefront area of astrophysics, extensive international collaboration and industry contacts will give all the participants much more than the PhD alone, and provide the best possible start to a career in space-led research.